For a successful ascend to Mount Damavand Iran you should know the necessary information about this giant volcano, trails and campsites. Trek to Damavand summit is not technical and does not require major trekking skills. The main challenge of the climb is acclimatization and accommodation. In this topic you can find the essential information for Damavand south route accommodation, lodgings, settlement, tenting and camping. Polour Camp is the best summer and winter starting point for mountaineers who want to trek Damavand either from the classic south route or the west face of the mountain. This campsite was made by Iran Mountain Climbing Federation in Polour Village in 2001 near the Haraz Road. Read details in Camp 1 Polour Hut. 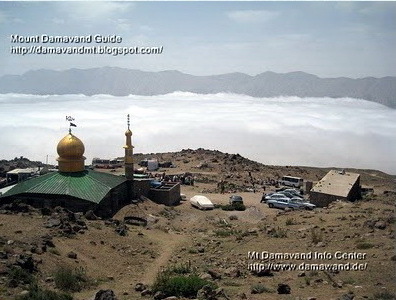 Goosfand Sara (sheepfold) also called Summer Base Camp, or Saheb al Zaman Mosque is a mountain campsite situated at at the elevation of 3040 meters above sea level and is the summer starting point for Damavand hiking. Here there is a little mountain haven or shelter, a mosque called Saheb Zaman (or Saheb al Zaman) and a sheepfold. Find more details in Damavand Camp 2 Base. gear to this campground. You may find water and some food here. However it is recommended to bring and utilize your very own staff. It is possible to use mule/donkey to carry your gear to the top camp called Camp 3 Bargah Sevom. Bargah Sevom is the 3rd and the last mountain resort of Damavand South face. In this resort there is an Old Shelter/Refuge, a New Hut and some area for tenting and outdoor camping. The New Hut was made in 2009 by Iran Mount Climbing Federation and gives accommodation and some other services to climbers and mountain tourists. Find more information in Camp 3 Shelter and Camp 3 New Hut. Damavand South Route Campsites. Damavand campsite and resort. Mount Damavand Iran camps. Damawand volcano trails and camp for accommodation. 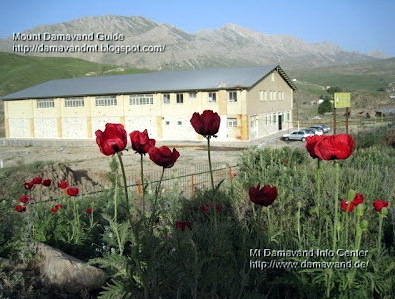 Damavand south route lodgings, settlement, tenting and camping. Iran Mountain and Sport Climbing Federation campsites and resorts. Damavand camps, shelter and hut. Accommodation in Iran Mountain Climbing Federation Camps and Resorts. Camp 1 Polour Resort. 1st Camp – Polour Resort. GoogleEarth route and trail map and satellite image. First campsites, Camp One Polour Hut. Damavand South Route, First Camp, Polour Resort. First camp, second camp, last camp. Damavand Campsite, Base Camp, Base Shelter, Route and trail map gps tracks to the summit. 2nd Camp – Goosfand Sara (sheepfold). Camp 2 Base Shelter/Refuge. Summer Base Camp, or Saheb al Zaman Mosque. Camp 2 Base Goosfand Sara, Camp 3 Bargah Refuge, Camp 3 New Hut. Base Camp Shelter, Bargah Sevom Shelter. 3rd Camp – Bargah Sevom. Damavand 3rd camp Bargah Sevom. Last resort of Damavand South face. Demavand top/high resort Old Shelter/Refuge. Camp 3 Bargah Sevom Old Shelter/Refuge for hiking trekking and climbing tours. Camp 3 New Hut for Ski touring and Climbing Expedition Tours. Classic South Route summer expedition guided tour.